The Source is in Discover Grove City, the official magazine of the City of Grove City. Every edition included the activity guide detailing Grove City Parks and Recreation Department offerings. You have the opportunity to see a fresh set of classes and activities six times per year to help you select what fits best in your family’s busy schedule. The May/June Source online, phone and in-person registration begins Monday, April 29 at 8 a.m., classes begin Monday, May 6. Flip through the May/June Source or download the May/June Source, for city news, upcoming Parks and Recreation classes, activities and community activities. There are a few spring classes open through the end of April. Flip through the March/April Source or download the March/April Source, for city news, upcoming Parks and Recreation classes, activities and community activities. To register online, visit the Online Registration page; call the Parks and Recreation Office at 614-277-3050; visit the office in the Kingston Center, 3226 Kingston Ave.; or complete a registration form and place with payment in the drop box on the parking lot side of the Kingston Center or mail to the Kingston Center. Registration for 55+ activities also can be completed at the Evans Center, 4330 Dudley Ave. Patrons must establish an online account I.D. The Parks and Recreation office must confirm all online account I.D. requests. Patrons are encouraged to set up their online account I.D. by visiting the Parks and Recreation office or calling 614-277-3050 between 8 a.m. and 5 p.m., Monday through Friday. Once the online account I.D. has been activated, participants register for classes using their e-mail address and a password. The Source is also available in the Grove City Parks and Recreation office in the Kingston Center, 3226 Kingston Ave.; City Hall, 4035 Broadway; Grove City Museum, 3378 Park St.; Jackson Township Administration Building, 3756 Hoover Road; Visit Grove City, 3995 Broadway; Grove City Area Chamber of Commerce, 4069 Broadway; and Grove City Library, 3959 Broadway. Before registering for a Grove City Parks and Recreation Department program online you must secure an online account I.D. and password. 1. New to online registration? A) Call the Parks and Recreation office at 614-277-3050 (or stop in) and you will immediately receive an online account I.D. and password. After you receive your I.D. and password you may proceed to Online Program / Activity Registration (proceed to step 2). B) Use the online registration to receive an online account I.D. Press: “OK” to add additional family members and your birth date. Once the primary contact’s birthdate is submitted you will be able to add more family members and/or finish. A CONFIRMATION EMAIL WITH ACCOUNT I.D. WILL BE SENT WITHIN TWO BUSINESS DAYS AFTER the Parks and Recreation Office has confirmed all information about you and/or your household. You can NOT register for an I.D. and sign-up for a program/activity UNTIL you receive your account I.D. Please plan accordingly. (Once you receive your account I.D. and password proceed to step 2). Forgot your sign-in email address? Contact the Parks and Recreation office at 614-277-3050. Note: Your initial password is the assigned online account I.D., please change after your first sign-in. 3. Want to search programs / activities? 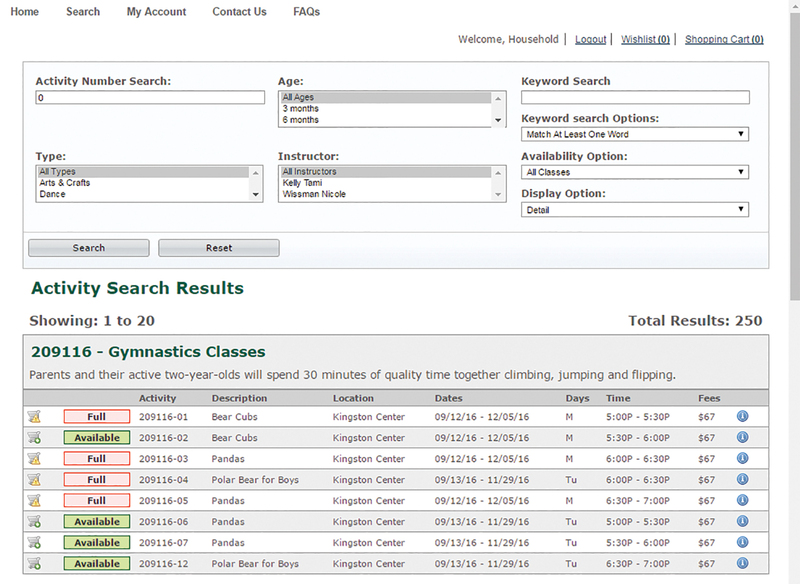 You may search for activities by activity number, age, type, instructor, keyword, availability, etc. A complete list of activities may be found in The Source, Grove City’s triannual activity guide. This book is available at the Grove City Parks and Recreation Department on Kingston Ave., City Hall, the Evans Center, the Grove City Library, the Grove City Area of Chamber of Commerce, the Grove City Welcome Center and Museum, Jackson Township Administration Building or at the top of this page. Read: And “Agree” to the terms and conditions to continue. Select: After you have selected all the courses in which you’d like to enroll, select “Proceed to Checkout” where you will be assessed a summary of charges. While your card is processing, DO NOT refresh or close the screen. Once the card has been processed, a confirmation page will appear. You have the option to print a receipt from this page. A copy will also be sent to the email associated with the online account I.D. A) If you would like to cancel your participation in a program / activity prior to the start of a class, please call the office at 614-277-3050. At this time, class cancellations may not be done online. B) You may always view a list of the classes in which your household has enrolled by clicking “My Account” on the main WebTrac screen and then “My History.” There is also an option to reprint a receipt, if necessary.